Under the Property Stock ad Business Agents Act 2002, licensees’ records in relation to the handling of trust money must be audited. 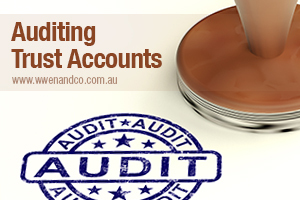 Who is required to have their trust accounts audited? Who is required to submit an audit? When must the audit be lodged? The qualified audit must be lodged within 3 months after the end of the audit period. The qualified audit for most agents must be lodged with the Director-General no later than 30 September 2015. If a qualified trust account audit is not lodged by the due date, licensees could be disqualified from holding a licence and possibly prevented from renewing a licence. In most cases, it is the licensed corporation that receives and is responsible for trust funds. Therefore, in most cases, a qualified trust account audit must be lodged by the licensed corporation. However, if an individual licensee receives and is responsible for trust money, then a qualified trust account audit must be lodged by the individual licensee. Note that the auditor is now also required to lodge a copy of the qualified audit with Fair Trading within 14 days after providing the report to the licensee. Who can conduct the audit? Auditors must be registered with the Australian Securities and Investments Commission (ASIC) or be qualified under s.115(1)(b) of the Act. Need help in complying with Trust Audit regulations?